Gareth Hinton takes a look at the career to date of the 2012 World Champion. Part 16 of Tracy Holmes' history of the pairs. 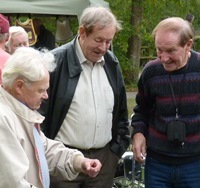 John Hyam brings us the sad news of Eric Jolly's passing. "I supported Liverpool Pirates and it was apparent that the team in 1960 needed point scorers after the injury to Brian Craven. One night the Pirates team included a rider under the name of "Gary Lindsay" who was our top scorer. The thought was that this was a senior league rider appearing under an assumed name. Can you shed any light on this mystery?" "My Uncle was Tony Clarke who sadly passed away this year. I love my speedway but was not old enough to remember seeing him ride. I would love to hear from people who saw him ride and what he was like as a rider"
"Has Buster (Raymond) Brown died and do you know the year please?" "I was a staunch Harringay Racers fan from when my father took me to see speedway for the first time in 1947-8 through to 1953 when Harringay closed down. I never missed a home match and sat in the supporters stand in the first bend. I remember a special night when, prior to the match commencing, a young Swedish rider called Olle Nygren was introduced to the fans, he did 4 solo laps on his orange painted bike and became an immediate Racers favourite. Olle's new team mates in those days were Split Waterman, Ron How, Jeff Lloyd, Jackie Biggs, Arthur Atkinson, Jimmy Squibb and possibly Lloyd Goff. Years later, early 80's, BBC Radio Norfolk presenter Roy Waller invited me to lunch so as to meet Olle, sadly I had to decline the invite due to tour commitments. " John Hyam brings us a great tale from Hastings about local man Harold MacNaughton. Tracy Holmes continues his detailed history of the World Pairs Championship. The year is 1982 and the action has moved down under to Liverpool. 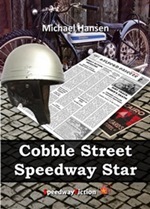 Details of a new speedway novel by Michael Hansen. The story is set in 1928, just as speedway makes its way to Britain. 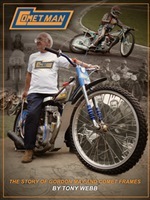 The latest edition of the Old Time Speedway Journal is available now for download. It will be of particular interest to fans of Ken Le Breton, sidecars and Norwich. "I cannot believe the superb growth of Rye House as a speedway venue. A friend of my parents took me to Rye House on two or three occasions, but in those days, the early fifties there was basically nothing apart from the track itself. I recall the 'safety fence' comprised sheets of corrugated iron attached to wooden posts. The shale was not of the best quality, but you could get a close-up of it as you could stand next to the fence on the far straight, if you reached out you could touch a rider as he came past....hence you either ducked down or copped for a mouthful of shale....but it was all good fun....I think the star rider for Rye House was Albie Golden. Congratulations to who have built Rye House into a track to be proud of. " "Bo bo valentine would love to here from you. I brought your bike and kit when you went home. All so see my web site all star classic speedway." Tony Webb tells us about his new book all about one of the backroom boys who influenced the sport. Tracy Holmes looks back on the 1981 World Pairs championship. The Americans were at their peak and were strongly fancied in the Katowice final. "Sadly, I never got the chance to see a match at the Belle Vue track, although I was a staunch supporter of the Harringay Racers from 1947 to 1953, a visit by Belle Vue was always a much contested match. In my day the team was captained by the legendary Jack Parker whilst the management was in the more than capable hands of the great Johnny Hoskins. A regular event always took place whenever Belle Vue visited Harringay.....near the end of the match, Split Waterman would steal Johnny Hoskins' trilby hat and burn it....it must have cost Mr Hoskins a fortune in hats. Thinking back to those great days of wonderful speedway racing, I cannot recall a single team that stood out as easy opponents to beat, Belle Vue, Wimbledon, New Cross, West Ham, Bradford, Wembley, Birmingham all had their ace riders....(my opinion) BelleVue - Jack Parker, Wimbledon - Barry Briggs and Ronnie Moore, New Cross - Ron Johnson, West Ham - Jack Young and Malcolm Craven, Bradford - Arthur Forrest, Wembley - Tommy Price and Freddie Williams, Birmingham - Graham Warren....while Harringay (during my time) - Vic Duggan, Jackie Biggs and Split Waterman, then later, the great Olle Nygren. Sorry if I missed out your favourite/s. " 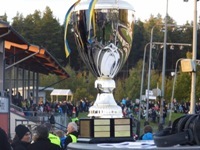 Phil Rice was over in Sweden this week to watch Indianerna take on Vetlanda in the Play Offs. He captured these pictures of the Indian's home track for us. Tracy Holmes takes us into the eighties, where PC and DeeJay were re-united for the Lions and the final was held in Yuogslavia. This is a belated tribute as I was in Malaysia when I got the sad news of the passing of a truly great man who was a hands on speedway enthusiast with a dream. I had the pleasure of meeting Brian in 2010 when I traveled to Ayr to write the story of his Pioneer park speedway, He was a modest and humble man who lived and loved speedway and people. Brian was firm in his instructions to me as an author. He wanted it recorded that he could not have created Pioneer Park without the support of many, many people and his devoted wife Margaret family. Eventually Brian approved my manuscript for the Field of Dreams which he asked to be dedicated to his wife Margaret. The name of Brian Hodder is up there with the legendary promoters of speedway, many riders, worldwide, hold fond memories of his hospitality and encouragement. "Does anyone have any info about Santry Speedway? When was it operational? Was it on the site that is now used for karting in that area?" "Yes, so sad to see it go was such nice evenings after been working in a factory all day and I was about a hour away from Hull but thoroughly enjoyed every moment." "Many thanks Ian. All helps with the fun of the affair. Cheers !" "Great to see the Tis Was episode with Bruce Penhall. I wonder where the set of Leathers is now that they gave away?." "Ron How was an ongoing favourite with Harringay Racer fans. One problem Ron may have had regarding a rise to total stardom was that he was usually paired with the great Split Waterman....such usually resulted in a 5-1 or 4-2 point tally, with Ron riding as wing-man to Split. He was a nice and charming guy who always ha d time for us kids and all other fans. I extend my most sincere respects to his family and friends, I'm sure Ron How will be very much missed by everyone who knew him."